where F is the Faraday constant, 96,500 coulombs (C), and n is the number of electrons transferred. Positive potentials and negative AG values are characteristic of spontaneous processes. 60xidation state is conventionally expressed in parenthetical roman numerals after the symbol or name for the element [e.g., Fe(II)]. at 25°C (R is the gas constant, F is the Faraday constant, and T is the absolute temperature.) Potentials on this scale are sometimes given the symbol EH to indicate that values are on the hydrogen scale. 7More properly, pH = — log (activity of H+); then pE = — log (activity of electrons). The acid and base reactions are related by the ion product of water, and either can be used under all conditions. oxygen, equation (9-42) should have the value of the oxygen partial pressure that would be in equilibrium with the actual O2 concentration according to Henry's law. 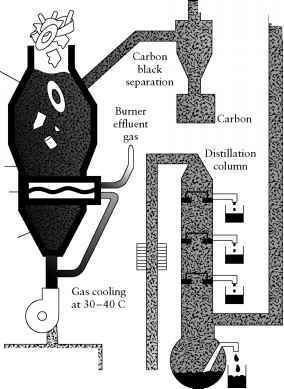 When used to describe a set of conditions or an environment, "oxidizing'' and "reducing'' are relative terms; that is, they have meaning only with respect to the reaction or compound being considered. Conditions that exhibit low values of pE will favor reductions of many elements and compounds, and the lower the value, the greater the number of materials that can be reduced. High pE values will favor oxidation similarly. respectively. [Reaction (9-44) is just the reverse of (9-41).] The pE values of these reactions set the limits of strength for oxidizing or reducing substances that can be stable in water. The values are dependent on the pH and on the oxygen or hydrogen concentrations (or equilibrium partial pressures). An example of the use of pE is shown by consideration of the equilibrium between sulfate S(IV) and sulfide S(-II) [reaction (9-46)], where the conditions under which SO44 or sulfide predominates in solution can be related to the pE value. From this, it can be seen that the concentrations of SO4 and HS will be equal at pE = —4.76. On the other hand, at the pE of oxygen-saturated water, 12.6, the ratio [SO4— ]/[HS—] is very large (log [SO2—]/[HS—] = 138.9), and hence SO2— is the stable form. Plots can be made for [SO^] and [HS— ] as a function of E or pE (the slopes of the plots are easily established, as was the plot of pH vs log concentration for weak acids) at a particular total concentration of SO4— plus HS— to show the behavior graphically (see Section 10.4). FIGURE 9-15 Pourbaix diagram for the sulfur system. The dashed lines are the stability limits for water. Adapted from G. Faure, PriKcip/es App/icafioKs o/lKorgaKic Geoc^eraisfry. Copyright © 1991. Reprinted by permission of Pearson Education, Inc. Upper Saddle River, NJ 07458.
will be deemed important—and draw the plot accordingly. 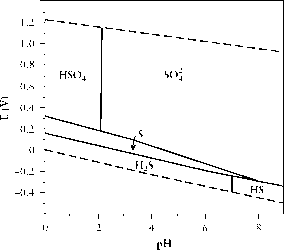 The upper and lower limits in this diagram are the stability limits for water; they are not limits on the existence of particular states in the absence of water. Potentials are based on thermodynamics and represent equilibrium situations; they say nothing about how fast equilibrium will be reached. Many redox reactions have multistep and complex mechanisms. Kinetic limitations may make reactions slow even when they are strongly favored thermodynam-ically. This book would be carbon dioxide and water now if it were not for kinetics! Many electrode reactions require a larger potential than calculated to overcome a kinetic barrier (the overpotential). Redox reactions involving oxo anions often take place slowly, the more so the higher the oxidation state of the central element, and the smaller it is. Thus, the perchlorate ion, ClO4— is reduced more slowly than chlorate, ClO—, and chlorate more slowly than iodate, IO—. Reactions involving many diatomic molecules such as 02 also tend to be slow. where the oxygen atom originally on the Cl in ClOH is transferred to the nitrogen. In other reactions involving oxo ions, the first step is protonation of one of the oxygens to form water, which dissociates to leave an electron-deficient species that can bond to a lone pair on the reducing agent Not only are the potentials of such reactions affected by pH according to the Nernst equation, but so are the rates at which they can occur. What are the limitations of pourbaix diagram?